Upright: Painful endings, deep wounds, betrayal, loss, crisis. Reversed: Recovery, regeneration, resisting an inevitable end. 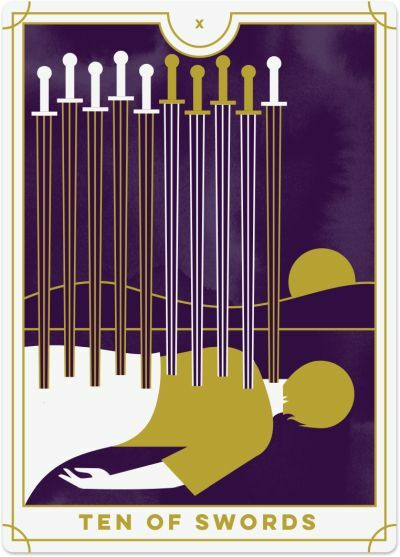 The Ten of Swords shows a man lying face down, apparently dead, with ten swords in his back. A red cape drapes over the lower half of his body as a sign of dignity as he leaves this world. While the dark sky is ominous, the sun is rising on the horizon, bringing a renewed sense of hope and opportunity. The calm sea in the background also brings solace, suggesting that even in times of darkness, there is a sense of peace and calm to be found. The Ten of Swords marks a painful yet inevitable ending. For example, a relationship may come to an abrupt end, your job may be cut, or a contract is broken. It is as if this ending has come out of the blue and rocked your world. You could have never expected it, but now it has happened, cutting to the core and leaving you feeling as if the world has crumbled in around you. You are grieving the pain of this shocking loss and wonder if you will ever love or find work or trust again. When the Ten of Swords appears in a Tarot reading, you may be the victim of another person’s betrayal or deceit. You feel as if you have been stabbed in the back and are reeling from someone else’s actions. Your partner may have cheated on you, a colleague may spread nasty rumours about you, or a family member has betrayed your trust. The pain inflicted runs deep not because what they have done is hurtful, but because you know deep down that this marks the end of your relationship as you know it with them. Along with feeling the pain, you may grieve the loss of the relationship. The Ten of Swords can suggest that you are taking on the role of ‘victim’ hoping others will pity you and save you from despair. You cannot change the actions of another person, but you can change how you respond. Even if you have been harmed or betrayed, you now have a choice to pick yourself up and move forward with your life, rather than falling down in a heap hoping someone will take pity on you. In that way, the Ten of Swords is about letting go and accepting your current circumstances. You no longer resist change but allow it to happen, even if it causes initial pain and hurt to you. You recognise that there must be a change to facilitate renewal, and you allow it to occur rather than fighting it. The good news is that the Ten of Swords marks the final ordeal – no more pain will come to you from that source. The hour is darkest before dawn, and you must experience the full impact of what has happened before you can move forward and start over. Is it going to be easy? No. But, will this ordeal last forever? No. Pick yourself up off the ground and reflect upon what happened to you and why, and what you can learn from the experience. When you do this, the hurt and pain will fade, and you will soon see why all of this needed to happen so that you can evolve into your fullest potential. The pain and hurt you have endured have not gone without purpose. Use the positive power within you to learn from your pain and draw wisdom from defeat. The Ten of Swords reversed indicates that you are combating an inevitable change or ending because you are not ready to face up to what is happening. However, the more you resist, the more this situation will continue to drag on, so it’s time to rip off the bandage (however painful that might be) and get this over with so you can start fresh. Trust that everything is happening for a reason and even though it may be difficult to understand what you are going through, know it is leading to your personal growth and regeneration in the long-term. Similarly, the Ten of Swords reversed may represent an old situation that ended badly. You are still carrying around wounds from it but have buried them so deeply that you do not realise they are still present (and hurting you). These old pains need to be dealt with once and for all. It may be difficult to delve back in, but it's the only way to release yourself of this pain and allow it to pass from your life. The reversed Ten of Swords encourages you to re-evaluate your circumstances and let go of any aspect of your life that is no longer serving you. Rather than dwelling on your painful past, it is essential to look ahead and realise how these events free you up to reshape your life and choose a new direction for yourself. You can free yourself of your past and create a new sense of self. Finally, the Ten of Swords reversed can appear as a welcome sign that the pain and sadness you have been feeling is ending. When upside-down, the swords in the man’s back look to be falling out, releasing him of the pain and hurt he has been suffering. You are releasing the memories of the past and allowing yourself the opportunity to move forward with a sense of renewal and hope for the future.